The food pantry is one of the missions of Old Bergen Church, and is a major part of our stewardship to the community. The OBC Food Pantry is run by the deacons with a few very dedicated volunteers, and has faithfully operated for over 20 years. The pantry is open the last Saturday of each month from 9:00 AM until 12:00 noon, except in November and December, when distribution is one week before Thanksgiving or Christmas. Food typically consists of boxed and canned items such as pasta, rice, milk, juice, vegetables, cereal, snacks, and frozen meats. 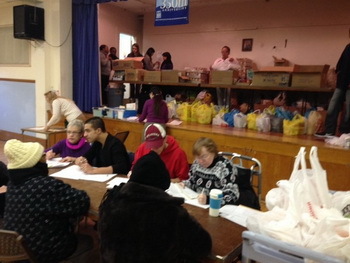 Bags of food are distributed from 9:00 AM to 12:00 PM. To obtain food, one must have a referral from any of the recognized agencies in Jersey City, NJ. All clients must bring proof of identification and their social security number. To receive an extra ("family") bag, parents must provide proof such as birth certificates or social security cards of their children. Some of the referral agencies in Jersey City include: Let's Celebrate, Horizon Health Center , Health and Human Services, Jersey City Episcopal Community Development, C-Line Community Outreach Center (Community Builders) , and Urban League. Contact the Church Office if you would like to volunteer.